A bid to cut the use of disposable cups at Wrexham Glyndwr University has stopped thousands being sent to landfill in just two months. The university, in partnership with Aramark Ltd who run its catering outlets, has introduced a 20p surcharge to all hot beverages served in disposable cups across its campuses – waived if you bring your own cup. The idea behind introducing the 20p penalty for disposable cups is to encourage staff, students and visitors to adopt a more sustainable approach to waste management, reduce the amount of waste going to landfill and to cut the amount spent on waste management so that funds can be invested into other university resources instead. 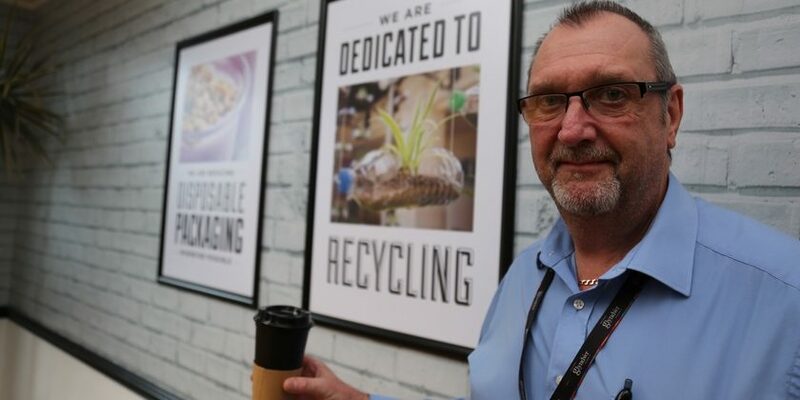 Wrexham Glyndwr University Director of Operations, Lynda Powell said: “We’re encouraging all customers of our hot drink outlets to help us reduce and eventually prevent the amount of waste going to landfill by bringing their own reusable cup. Paul Barton, Aramark’s catering manager added” “The 20p surcharge will be added at the cash register and at the end of each term, the surplus money raised will be used to support green initiatives at the university. Since introducing the 20p penalty at the start of term in September, almost 5,000 fewer disposable cups have been sent to landfill – 27 per cent of total sales. This is a very encouraging start and Wrexham Glyndwr’s long term goal is to stop using disposable cups altogether. Read 1,245,550 times in last 30 days, and 73,799,619 times since we started in 2011.